Jurassic "Handle" robots combine wheels and grippers for stacking boxes. The Massachusetts tech vendor Boston Dynamics has become a social media darling with videos that show its robots completing amazing feats like a humanoid flipping backwards or a canine walking down stairs. Now the firm has launched a robot called "Handle" that combines legs and wheels in a platform the Waltham, Mass.-based company says is a perfect fit for warehouse work. A video posted Thursday shows a pair of Handle-bots maneuvering through warehouse racks as they stack cardboard boxes on pallets and then place them on conveyors. While the machines appear to complete the tasks efficiently, they also bear a somewhat menacing appearance—picture a six-foot tall, 230-pound dinosaur prowling through your DC. Online comments also compare the critters to an ostrich and a "Segway bird," in reference to the self-balancing scooter. 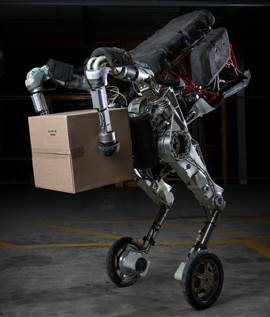 Boston Dynamics says the Handle-bots are capable of complex work like autonomously performing mixed SKU pallet building and depalletizing. Strong enough to handle boxes up to 33 pounds, the units use an on-board vision system to track marked pallets for navigation and to find individual boxes for grasping and placing. Handle robots are even able to use a "force control" feature to nestle each box up against its neighbors as it stacks boxes on pallets. For a full demonstration, the company plans to operate the bots on the show floor at the ProMat material handling trade show in Chicago April 8-11, Boston Dynamics said. Feedback: What did you think of this article? We'd like to hear from you. DC VELOCITY is committed to accuracy and clarity in the delivery of important and useful logistics and supply chain news and information. If you find anything in DC VELOCITY you feel is inaccurate or warrants further explanation, please ?Subject=Feedback - : Boston Dynamics builds dinosaur-shaped robots for your DC">contact Chief Editor David Maloney. All comments are eligible for publication in the letters section of DC VELOCITY magazine. Please include you name and the name of the company or organization your work for.